The country's main truck manufacturer, assistance will receive $1 billion in assistance, as the government looks to provide essential support for the automotive industry. KamAZ has become Russia's first automotive concern to receive real state support against the backdrop of a slowdown on the car market. The government has ruled to provide the plant with state guarantees worth nearly 35 billion rubles ($1 billion) for a large-scale investment program. The government resolution, signed on August 11, says that state guarantees are issued for KamAZ's interest-bearing non-convertible bonds with a maturity of up to 15 years. In other words, the state guarantees to repay the nominal value of bonds to that amount in the event that the company is unable to meet these obligations by itself. The KamAZ board of directors approved the bond issue in late May. Over the next three years, the company plans nine issues of 15-year bonds. 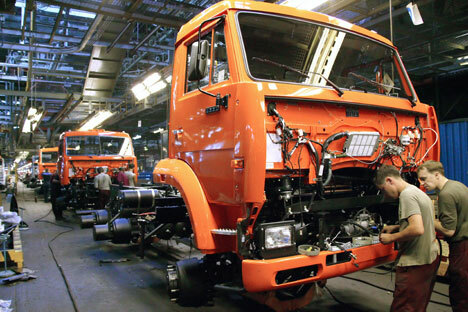 KamAZ's $1.9 billion (70.1 billion rubles) investment program began in 2013 and is due to be completed in 2020. The company itself is prepared to invest just $750 million (27 billion rubles). The program envisages the release of new truck models, modernization, and increased efficiency. The company's sales forecast for 2015, including export, is 60,000 trucks. In 2013, it sold 43,800 vehicles. KamAZ has become the first automotive concern to secure the state's financial support at a time of a protracted downturn on the automotive market. According to Yelizaveta Belugina, head of research at FBS brokers, the main reason why KamAZ has received support is that it has already developed a large-scale and complex long-term project that envisages the construction of new plants and modernization of the whole technological cycle. "A project like this is strategically important for the Russian industry and fits in very well with the current concept for its development," she explains. In the meantime, measures are being considered to support the whole of the automotive sector, including the resumption of the state car scrappage program and the reduction of the service life limit for commercial vehicles. "The situation is indeed rather difficult,” says the transcript of Prime Minister Dmitry Medvedev's meeting with KamAZ head Sergei Kogogin, published on the government's website. “Generally speaking, the automotive market, and the truck market in particular, is a very accurate indicator of the overall state of affairs. That is why we shall, of course, be thinking of how to provide various incentives for that market"
Based on Kommersant and RBC Daily.